The PM-10.4-MFD is designed and certified for installation in military aircraft. To meet the variable and challenging lighting conditions common in the cockpits of military aircraft, the PM-10.4-MFD features a Dual-Mode, Hi-Brite/NVIS backlight system with luminance adjustment ranging from 1500 cd/m2 for visibility in glaring direct sunlight conditions, down to 0.5 cd/m2 for night time NVIS compatible conditions suitable for viewing with NVGs. The rugged, machined aluminum bezel features twenty eight, silicon rubber buttons with NVIS compatible backlighting ensuring legibility under all lighting conditions. The bezel buttons are fully programmable and communicate communicate via both RS485 and USB. The PM-10.4-MFD supports 2x DVI, 1x VGA and 1x Composite Video input all running in MS-38999 connectors. 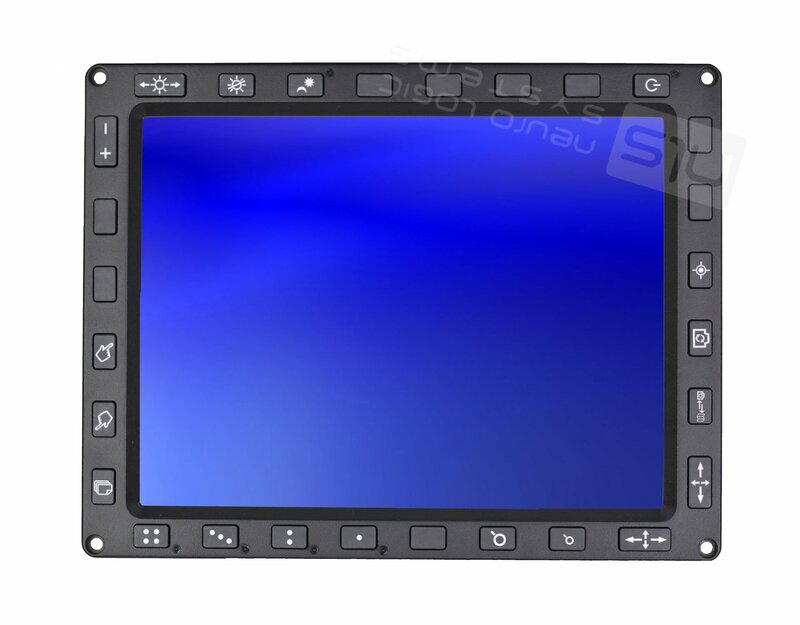 The PM-10.4-MFD can operate in either Landscape or Portrait orientation. Switch selected 90 degree hardware rotation of Composite Video input guarantees live camera video signals are always displayed upright. The Military grade DC power supply accepts 12V-36VDC with full transient and surge protection to MIL-STD-1275/-704 standards.